The Catholic Women's Devotional Bible is designed specifically to nourish your spirituality, making it easy for you to form a habit of daily prayer and reading. Designed especially to meet the needs of Catholic women accustomed to liturgically-based forms of worship, it includes a six-year reading plan tied to the Lectionary, making it easy for you to locate readings for daily and Sunday liturgies. Additionally, each weekend devotional is based on the life of a particular woman of the Bible, helping you see the relevance of her story today. Each book of the Bible is preceded by a brief introduction highlighting its historical context and its most important themes. Additional articles focus on topics like the sacraments, holy days, the liturgy, and spiritual direction, explaining the link between tradition and Scripture to help you gain a greater understanding of your faith. Meditations are drawn from a rich variety of authors, including: Joan Wester Anderson, Sister Wendy Beckett, Esther de Waal, Catherine of Siena, Dorothy Day, Fran Ferder, Briege McKenna, Julian of Norwich, Joyce of Rupp, Mother Teresa, Teresa of Lisieux and Macrina Wiederkehr. Scripture offers wisdom for important everyday issues like relationships, marriage, child-rearing, simplicity, prayer, and finding real peace. If you dip into it regularly, it will become a well of continual refreshment, nourishing your faith and strengthening your sense of God's loving presence in your life. 52 Weekend Devotions, Focusing on Women of the Bible. 50 Articles Linking Scripture with Catholic Life and Faith. 6-Year Reading Guide Keyed to the Catholic Lectionary. NRSV Women's Devotional Bible: Hardback, Catholic Edition by Ann Spangler was published by Zondervan in August 2000 and is our 17947th best seller. The ISBN for NRSV Women's Devotional Bible: Hardback, Catholic Edition is 9780310900610. Be the first to review NRSV Women's Devotional Bible: Hardback, Catholic Edition! Got a question? No problem! 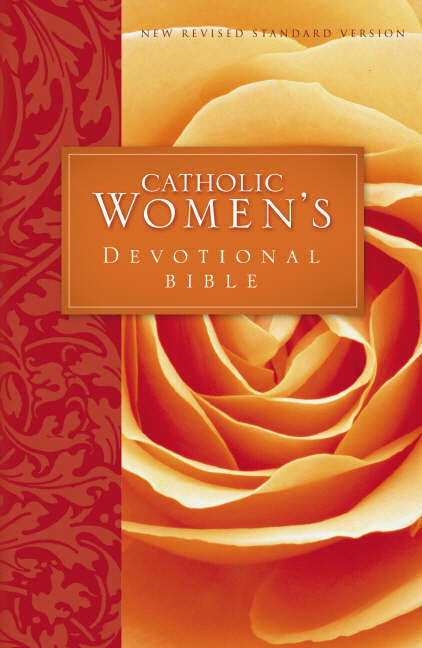 Just click here to ask us about NRSV Women's Devotional Bible: Hardback, Catholic Edition.